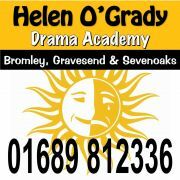 With its own unique curriculum, the Helen O'Grady Drama Academy offers Developmental Drama Classes for 2½ - 18 year olds. One of the greatest life skills we can give our children is the ability to communicate confidently. At the Helen O’Grady Drama Academy, children can learn to do this whilst having an enormous amount of fun. Every week there's something new! We've got fantastic plays to act in, plus brilliant teachers who want to have just as much fun as our students do! At Hayes Primary School, we run an exclusive after school class on Mondays for Year 1 to Year 3. In July, the class perform to family and friends in our Summer Productions at The Ship Theatre in Sevenoaks. Many of our Hayes Primary students then graduate to one of our local classes in Hayes, Shortlands, Orpington, Chislehurst, Petts Wood or Biggin Hill. Students are offered a FREE TRIAL before any payment is made. Fees are adjusted according to the term length. Discount offered to siblings. Monthly standing order payments are available. Kind regards, Helen Walls, Principal.